Heat oven to 325°F. In 5-quart Dutch oven or roasting pan, heat oil over medium-high heat until hot. Add beef roast; cook about 5 minutes on each side or until browned. If desired, drain off excess fat. Sprinkle pepper on both sides of beef. Add 1 of the onions, 1 of the stalks of celery and bay leaf to beef. Dissolve bouillon in boiling water; reserve 3/4 cup. Pour remaining 3/4 cup bouillon around beef. Bring to a boil. Cover. Bake at 325°F. for 1 hour. Add remaining vegetables; cover and bake an additional 1 to 1 1/4 hours or until beef and vegetables are tender. 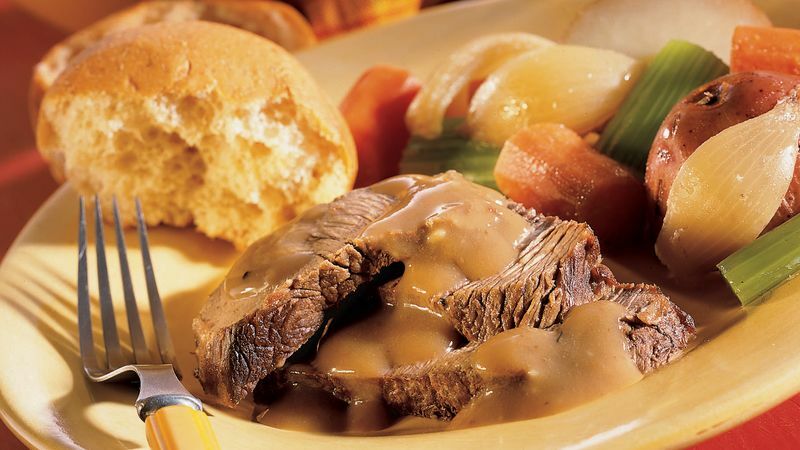 To prepare gravy, place beef and vegetables on warm platter; cover loosely to keep warm. Measure drippings from Dutch oven. If desired, skim off fat. Add reserved 3/4 cup bouillon to drippings to make 3 cups; return to Dutch oven. In small jar with tight-fitting lid, combine cold water and flour; shake well. Gradually stir flour mixture into drippings. Cook over medium heat until mixture boils and thickens, stirring constantly. If desired, add salt to taste. Serve gravy with beef and vegetables. Pot roast is traditionally prepared with an inexpensive, slightly tougher cut of meat. The slow braising tenderizes the meat and creates an economical dinner. The braised vegetables and pan-dripping gravy turn pot roast into comfort food. Brown the beef well before braising. Browning helps caramelize the surface of the meat to enhance flavor. A pot roast in the oven is the perfect reason to invite friends for an old-fashioned dinner. Serve the roast and gravy with garlic-buttermilk mashed potatoes, pickled beets and a vegetable relish tray. Finish the meal with apple pie and everyone will fell like they're back in grandma's kitchen.